The Dräger PARAT® C fire escape hood gives you at least 15 minutes escape time in the event of a fire. 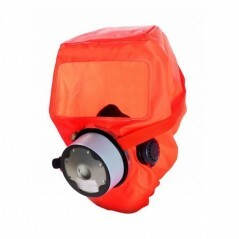 Prepare for emergencies with Draeger Part C hard plastic case escape hoods. Easy to put on hood provides at least 15 minutes of escape time in the event of a fire. Protects from smoke, CO, and other toxic gasses usually present in a fire. Large visor with anti-misting treatment ensures better vision during a fire emergency.